Ludwig Meidner (1884 Bernstadt, Silesia – 1966 Darmstadt) is one of the most outstanding and versatile artist personalities of the 20th century given that he registered the convulsions and upheavals of his time with a seismographic sense and reflected on them in both his pictorial and literary work. 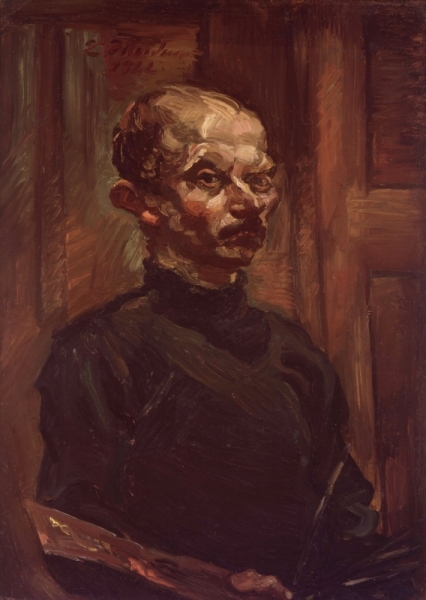 Yet time after time Meidner’s own work is permeated by breaks, such as for example his publicly proclaimed rejection of Expressionism and his embracing of the Jewish religion in the early 1920s, or his increasing isolation as a result of a prohibition to paint and his emigration in the Nazi era, but also the revitalization of his painting after his return to Germany in the 1950s. On returning from exile in England, Meidner settled in the Rhine-Main region, living first in a Jewish Seniors’ Home in Frankfurt, then moving into a studio-apartment in Marxheim, now part of the city of Hofheim am Taunus. Finally, he moved to Darmstadt in 1963, at the invitation of the head of the Culture Department. The joint project marking the 50th anniversary of Meidner’s death aimed to pay tribute to him as a remarkable painter and at the same time highlight a few of the lesser known aspects of his work. The individual exhibitions approached the artist and draughtsman from different angles which, individually, but above all together, contributed to open up new access roads to Meidner’s complex oeuvre and address continuities and breaches in it.